Even before Nolan Blansit introduced the first African violet cultivars with yellow-streaked flowers (e.g. `Majesty,’) growers have been fascinated with this unusual color, which is after all on the opposite side of the color wheel from the wild-type “violet” colors of the species plants. However, despite the popularity of yellow and yellow-streaked African violets, the molecular structures of the pigment(s) responsible for the yellow color have so far not been determined. Yellow and ivory pigments have previously been isolated and shown to be water-soluble, but not yet fully characterized. The flowers of African violets (Saintpaulia cultivars) derive their colors from water-soluble pigments in the large central vacuoles of the epidermal cells. Unlike many other plants cultivated for their flowers, Saintpaulias lack chromoplasts and therefore do not contain the carotenoids and xanthophylls responsible for many of the vivid yellow and orange colors of tulips, marigolds, and sunflowers (Helianthus). Instead, they produce a variety of anthocyanins and other flavonoids, some of which have been chemically and structurally characterized. Understanding these structures, particularly if they are different from the known anthocyanins as anticipated, will provide insight into the range of colors that are possible for African violets. Water-soluble plant pigments in general usually have a “modular” structure based on a central scaffold, often a flavonoid structure, with hydroxyl groups and sugar moieties in different places determining the observed range of colors. The yellow and ivory pigments are likely to be based on one or more scaffolds that are different from the known anthocyanins, and examination of their structures in comparison to other known pigments may make it possible to predict whether stronger yellows, or other novel colors such as peach or orange may be developed by continued hybridizing efforts. Of course, full understanding of this process would require sequencing and perhaps structure determination of the enzymes that produce the soluble pigments. Although this is beyond the scope of the current project, it is an attractive direction for future research. 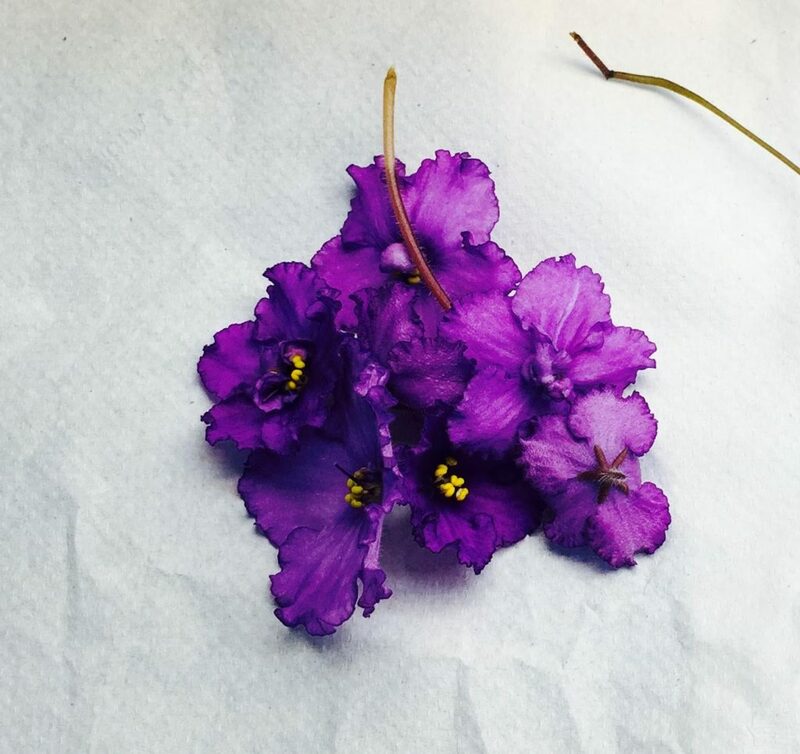 Some of the pigments that have been thus far identified in African violet flowers include malvidin 3-rutinoside-5-glucoside (blue), malvidin 3-rutinoside (coral blue), peonidin 3-rutinoside-5-glucoside (red), peonidin 3-rutinoside (coral red), peonidin 3-rutinoside (coral), and pelargonidin 3-rutinoside-5-glucoside (pink). (Smith, 2014) Recently, the genetic basis of color variation certain fantasy varieties has been described in detail; for the pink-and-blue fantasy flowered cultivar `Thamires’, flower color was found to correlate with expression levels of the enzyme flavonoid 3’-5’ hydroxylase (F 3’-5’ H). These phenotypes are due to retrotransposon-related insertions and deletions in the promoter region of the F 3’-5’ H gene, upstream of the open reading frame coding for the enzyme (Sato, Kawabe, Hosokawa, Tatsuzawa, & Doi, 2011). High F 3’-5’ H expression levels, which are produced by excising the transposon, yielded a blue flower color, while lower F 3’-5’ H levels led to the pink color. The particular anthocyanins produced are malvidin, peonidin, and pelargonidin derivatives, consistent with previous observations (Tatsuzawa, Hosokawa, Saito, & Honda, 2012). A prior study of a different blue and pink fantasy cultivar (`Fantasy Charm’) found that it contained kaempferol derivatives in addition to the usual malvidin and peonidin derivatives. Specifically, the blue regions of the flowers contained malvidin 3-rutinoside 5-glucoside, while the pink regions had peonidin 3-rutinoside 5-glucoside. Additionally, both types of tissue also contained kaempferol 3-O-glucoside (Griesbach, 1998). This finding is highly significant to the current research because kaempterol itself is a yellow flavonoid. Thus, our own and other studies of fantasy varieties informs our investigation of the yellow pigments both indirectly, via the development of experimental protocols we can modify, and directly, by providing spectral data and structural analysis for potentially similar molecules. 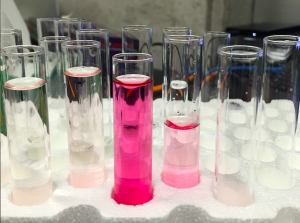 This co-pigment may interact with the anthocyanins in solution, modifying their color. However, even if the kaempferol derivative does not contribute significantly to the observed color of `Fantasy Charm’, its presence as a relatively abundant co-pigment serves as a proof of principle that Saintpaulias are capable of producing yellow-colored flavonoids. We tried separating the pigments from many African violet cultivars, and found several anthocyanins as well as varying amounts of the yellow compound. However, we were very surprised by the cultivar that produced the most yellow pigment so far: Storm’s Eye (Sorano), which is purple with white fantasy puffs. Based on just looking at the flowers, we would not have expected to find any at all- they just look purple to our eyes! This may be interesting to hybridizers who are trying to produce brighter colored yellow African violets – starting with cultivars like this and breeding for reduced purple color might be easier than starting with less colorful yellow ones and breeding for more color.